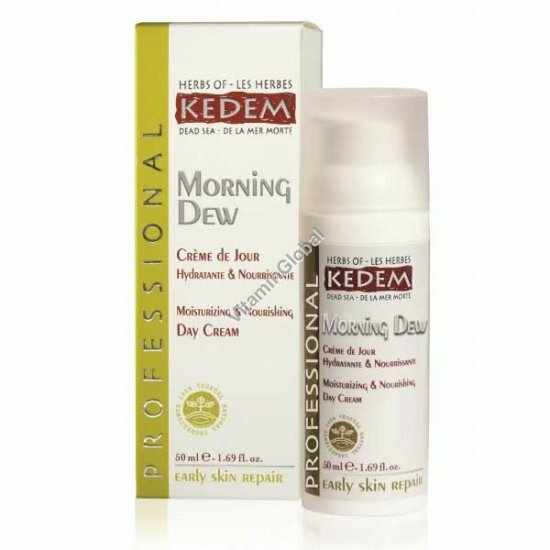 A high quality and effective moisturizing Morning Dew face cream formulated for daily use. The cream provides a long term treatment and preserves the natural moisture balance of the skin. The natural and organic oils of Jojoba, Avocado, Wheat Germ and flower exact of Chamomile and Geranium are absorbed into your skin, leaving it renewed. Morning Dew moisturizing day cream contains extracts of plants grown in the Judean Desert, next to the Dead Sea and in the Jordan Valley, as well as Dead Sea water. Ingredients: water, Sunflower seed oil, Alcohol, Glycerin, Apple extract, Clary oil, Dead Sea Salts, Carnauba wax, Shea butter, Grape seed oil, Avocado oil, Coconut oil, Jojoba oil, Olive oil, Sesame oil, Wheat germ oil, Magnesium hydroxide, Grapefruit peel extract, Lavender extract *, Lavender oil *, Olive leaf extract, Lemon myrtle oil, Coriander extract, Everlasting leaf extract *, Geranium extract *, Lemon peel e extract, Myrtle extract *, Chamomile flower extract, Inula helenium extract *, Wormwood extract *. Instructions for use: Apply a small quantity on a daily basis and absorb into skin.